With a commitment to manufacture, export and supply a wide range of Plastic & Glass Packaging Product at cost effective prices, Letap International came into existence in the year 1990. The range of products includes Perfume Glass Bottles, Nail Polish Bottles and Roll On Glass Bottles. We are committed to deliver the best quality products at competitive prices thus leaving no room for consumer grievances. Acknowledged for their quality, reliability and durability, our products are setting trends in the international markets. We consistently strive and work hard towards satisfying the needs and requirements of our valued clients. In order to attain the same, we use quality raw material, advent machinery and latest technology in fabricating these products. All our raw materials are procured from trusted and authentic vendors who are well known names of the market. Further, we are supported by the team of adroit, skilled and diligent professionals who are appointed on the basis of their qualifications and experience in this domain. These professionals make sure, the products manufactured by us are in adherence with the international quality standards and guidelines. Moreover, our quality controllers stringently test each product on various stages to ensure its flawlessness. Owing to our fast transportation facilities, easy payment options and timely delivery of the product we have been able to gain a formidable position in the market. We are exporting our products in All over the World. Under the able and visionary guidance of our mentor ‘Mr. Praful Patel’ we are able to maintain a unique stature in this domain. He has been our guiding force and has motivated us to perform better in every business undertaking. For over the years, our clients have admired the innovativeness and exclusiveness of our designs. Our organization has always been charmed by serving our clients with an unparalleled range of quality of our products that are manufactured and exported across the globe. We channel all our efforts and are directed towards retaining the highest levels of quality. Further, we supply and export a quality inspected products that are fabricated under the supervision of our quality experts who ensure to use the finest quality raw material and technology at our high-end manufacturing facility. We are backed by a highly committed and hard working team of creative and efficient professionals from the industry. These professionals and experts help us to execute and plan out our manufacturing and exporting processes in the proper and desired manner. Our team members hold extensive knowledge about packaging techniques, that is necessary to pack our products in a flawless manner. Further, our experienced professionals help us out with our intricate legal formalities in our business activities. Moreover, Our team performs in a systematic and methodical manner to comprehend and meet the varied client demands well within the assured schedules of delivery. Infrastructure is one of the major reasons of success of any company. At our location, we have set up a world-class infrastructure facility, which comprises of several advance & cutting-edge technology based machines and tools that support us with the obstruction free manufacture, storage and loading & unloading of the proposed series. Furthermore, we have recruited experts, who manage the systems and perform up gradations. 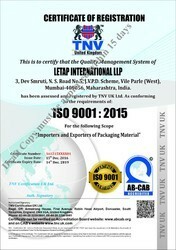 Letap International LLP an ISO 9001:2015 certified company are one of the preferred choices of customers for proffering quality grade Plastic and Glass Packaging Products. From the very beginning, we have been focused to proffer a perfect blend of quality and price. Our esteemed customers place immense trust in our abilities and depend upon us completely for the attainment of their varied demands, within the promised time frame.